Home › Home and Kitchen › 16" X 12" Photo Booth Prop Sign 2-Sided Design. 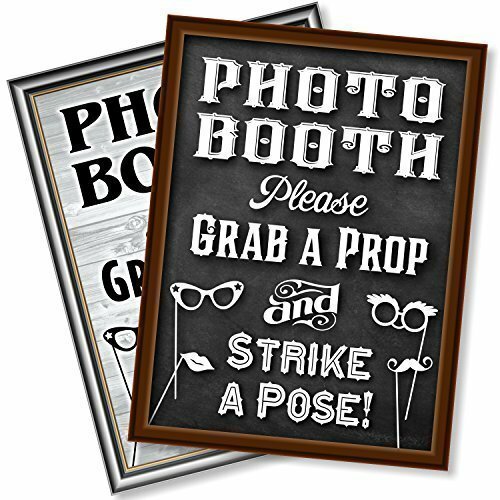 Chalkboard Style On 1 Side An..
16" X 12" Photo Booth Prop Sign 2-Sided Design. Chalkboard Style On 1 Side An..
SPECIAL DISCOUNTED LAUNCH PRICE. We're Just Starting Out and Would Love For You To Take Advantage Of This Special Price and If Your Happy We Would "LOVE" for You Give Our Small Little Company a Review to Help Us Grow! THE BEST LOOKING BOOTH PROP SIGN. Much Time And Thought Went Into This Chalkboard/Rustic/Vintage Design. As A Small Family Run Sign Shop We Aim To Provide The Best Looking Designs For Our Customers at a Very Reasonable Price. Tell Your Guests to Take Action With This Attractive Professional Design. Great for All Types of Parties & Events. Weddings Birthday Parties, Baby & Bridal Showers. Etc FAQs Can This Sign Be Used For Outdoors? I've Bought The Cardboard Signs and Have Been Very Unhappy with Them Yes. These signs are made for outdoor or indoor use and are printed in full color with outdoor uv inks that are good for 2-4 years outdoors so your sign should last a very long time. Is This Listing fro 1 Sign or 2 Signs This Listing is for "ONE" sign but is "TWO-SIDED" with a different design on each side. We did this to offer you a higher value and to appeal to a greater number of potential customers like yourself. Do You Offer A Warranty Yes We Do. We'll do all we can to make it right.. but if we can't we still want to make you happy so simply return it for a full refund.